Ha! I think there’s a lot of clones and debuts on the music scene that are searching for inspiration in the projects that were determinising direction in the 90’s, and breaking the scene with creativity, and this German duo Deadly Injection is just that. Fresh debut of this duo has transferred me right back to the 90’s when I put my favourite Solitary from the Claus on cassette and I did not know how to tear it off. I cannot help, but this is a clear clone of exactly what Claus knew to mix into aggressive beats and analog lines. But now I’m not just talking about Claus because his bored manuscript I don’t follow for quite some time now. Deadly Injection is a clone as it should and from the stick of the bone but it’s surprising and mainly it’s fun. It is ravenous and melodic. Sometimes it’s the old school primitive but from the base its punk orientated. 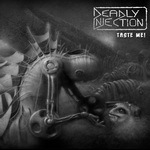 Share the post "Deadly Injection – Taste me! | Review by Alien E zine"